Every 24 seconds someone is killed in a road traffic crash. And the countdown is constantly getting shorter. According to the World Health Organization’s recently released Global Status Report on Road Safety 2018, road traffic fatalities claim more than 1.35 million lives each year, injuring 50 million more. 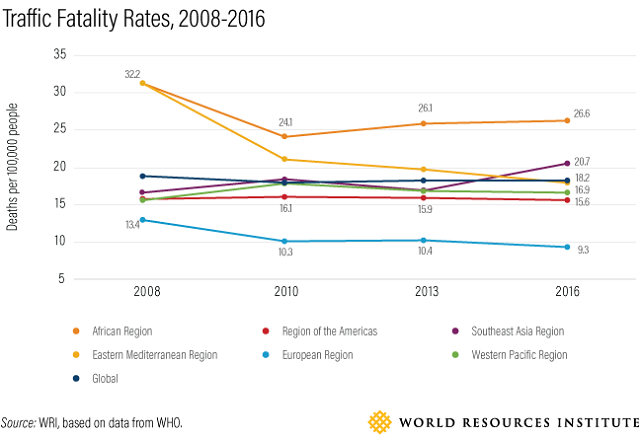 From 2013-2016, road-related deaths increased in 104 countries, while reductions were reported in only 48. In 2015, 3,400 people were killed each day; today there are 3,700 deaths. At this rate, it will be nearly impossible to meet Sustainable Development Goal 3.6, which calls to halve road traffic deaths by 2020 compared to 2010 levels. With urbanization and motorization growing fastest in low- and middle-income countries, road traffic deaths in these regions are significantly higher than their high-income counterparts. It is estimated that 93 percent of all road traffic deaths occur in low- and middle-income countries, despite having only 60 percent of the world’s vehicles. Low-income countries have traffic fatality rates three times higher than high-income countries. 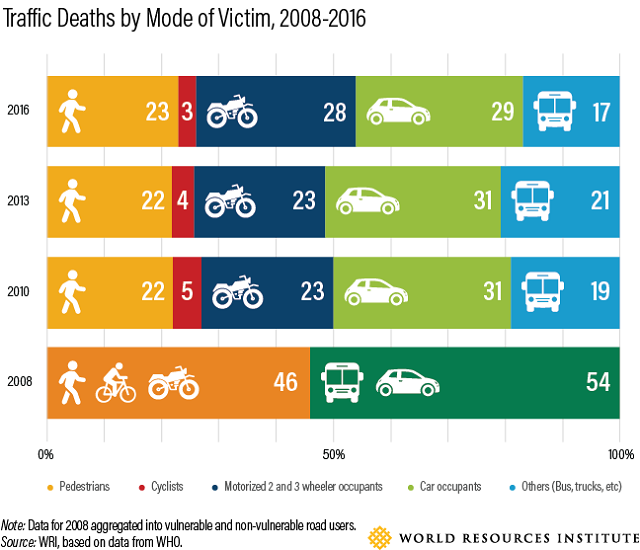 Worldwide, people walking and bicycling are the most vulnerable road users, accounting for about 26 percent of all traffic deaths. This figure is even higher in Africa (44 percent) and the Eastern Mediterranean Region (36 percent). In addition, motorcycle riders and passengers account for roughly 28 percent of all road deaths. 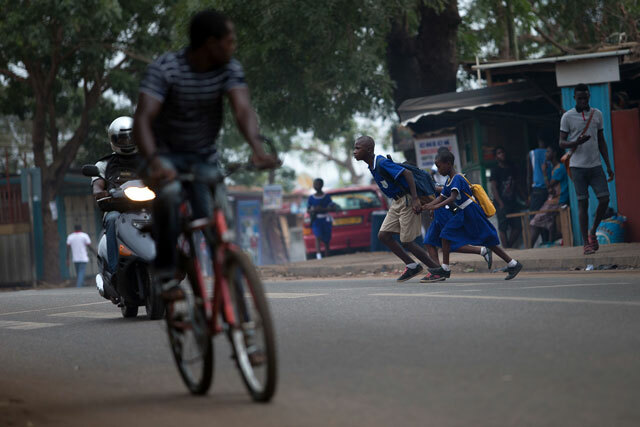 When accounting for most low- and middle-income countries, these vulnerable road users make up 80 percent of all traffic fatalities. Road traffic injuries are the leading cause of death for children and young adults ages 5 to 29 years old, and the eighth-leading cause of death for any age. Losing a working family member to death or serious injury can push families into poverty and stunt overall economic growth. On average, governments that do not invest in road safety could miss out on anywhere between 7 to 22 percent in per capita GDP growth over a 24-year period. Beyond rising urbanization and motorization, there are numerous contributing factors to these dismal numbers. Poor roads, including inefficient design and land use, unsafe speeds, inadequate vehicle safety standards, and weak law enforcement all contribute to dangerous conditions. Poor public transport and ill-maintained or non-existent pedestrian infrastructure in cities have further aggravated this problem. The key to real change in road safety is a paradigm shift in framing and building policy around road safety. New research suggests a “safe system” approach that shifts responsibility from people who use the road to people who design, set policy, execute operations and otherwise contribute to the mobility system, can quickly and significantly reduce injury and death rates. A study of 53 countries by WRI showed that those using a safe system approach, like Sweden and the Netherlands, have achieved both the lowest rates of traffic deaths and the largest reductions in fatalities over 20 years. Some individual cities have also had success adopting safe system principles. The WHO report calls particular attention to Bogotá, Colombia, for comprehensive changes in recent years. WRI and the Overseas Development Institute work to enhance road safety in Bogotá, Colombia. Over two decades, Bogotá has improved road safety through intentional and sometimes unintentional ways. An infrastructure building spree and reorganization of public transit from 1997 to 2006 helped provide safe alternatives to private car or motorcycle use. The city invested $2 billion to build more than 80 kilometers of bus rapid transport corridors, nearly 300 kilometers of bike lanes and improve more than 60,000 square meters of pedestrian infrastructure. Enforcement of seatbelt laws, drunk driving penalties and other policing policies also improved. These changes were driven by intense public demand for better commuting options and enabled by strong political leadership as well as institutional and tax reforms. Together, the reforms not only led to more ridership on mass transit but helped reduce traffic deaths by half. Then improvement plateaued. Officials couldn’t figure out why the death rate wasn’t declining any further. Given the dramatic success achieved through its integrated approach in the past, the city decided to formalize a combined urban mobility-road safety strategy. In December 2017, with support from the Bloomberg Initiative for Global Road Safety and WRI Ross Center, Bogotá adopted a new “Vision Zero” plan to proactively reduce deaths and serious injuries. Speed limits on five arterial roads, which accounted for a quarter of all traffic deaths, were reduced to 50 kilometers per hour, and road design changes were started in dangerous areas, especially around schools. The results are already being seen, as deaths on the five arterial roads dropped more than 80 percent in October 2018. As Bogotá shows, with rapid and widespread adoption of actions we know work, we can turn the tide. If all cities and countries adopted a safe system approach that combines infrastructure, design and regulatory changes, nearly a million lives could be saved per year. It is high time to put an end to this manmade disaster. Claudia Adriazola-Steil is Director for Health and Road Safety at WRI Ross Center for Sustainable Cities. Subha Ranjan Banerjee is a Transport Research Consultant for Health and Road Safety at WRI Ross Center for Sustainable Cities.